This page lists some of the most frequently asked questions we receive at the National Motor Trust about motoring and our Collections. I have an old car mascot. Can you tell me what sort of car it came from? From the very early days of motoring most manufacturers developed their own distinctive badges, radiator designs and logos. Some used distinctive mascots mounted on the radiators. It may, therefore, be possible to identify a car from its mascot. However, from the Edwardian period onwards there were also a huge number of accessory mascots available for owners to fit to their cars. They remained popular through to the 1950s and 60s when changes in car design and legislation led to their demise. Accessory catalogues of the time show a wide range of popular themes including birds, dogs, aviation, golf, angling, football, policemen and speed nymphs. Many of these accessory mascots survive in family collections. I have an old car mascot. Is it a Rolls-Royce Spirit of Ecstasy? 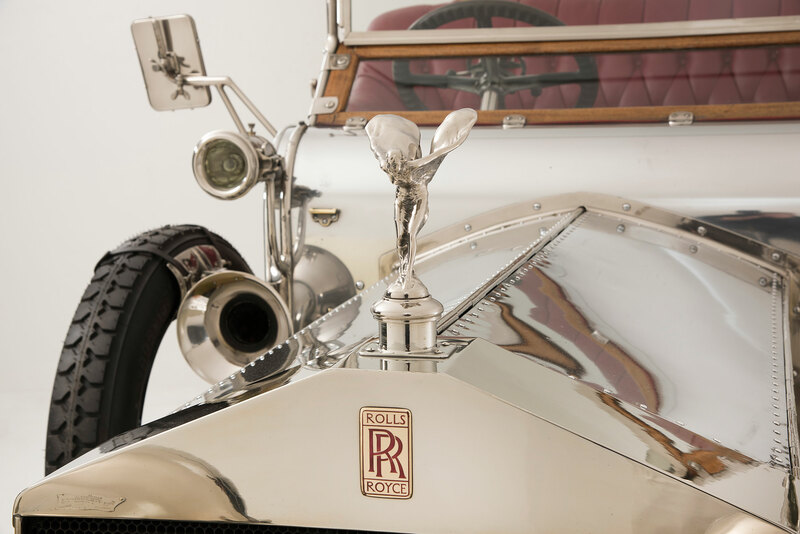 The famous Spirit of Ecstasy or Flying Lady was used on Rolls-Royce motor cars from 1911 onwards. Originally designed by the sculptor Charles Sykes, for many years the mascots were made by him and bore his signature. In the 1920s there were many designs of accessory mascots called Speed Nymphs and these can often be mistaken for the genuine Spirit of Ecstasy. Can you tell me what the car/motor cycle/lorry is in an in old family photograph? We are often asked if we can identify motor vehicles that appear in old family photographs. Whilst we are more than happy to attempt identification, the process can sometimes be time consuming and we do make a small charge. Given the poor quality of some old photographs, lack of detail or the small amount of the vehicle actually visible it is not always possible to make a positive identification. Can you tell me about my car’s history? Unless your car has a well-documented competition history it is very unlikely that we will be able to find anything specific about it within the Museum’s Collections. If your car did compete in events it may be possible to find references to it in contemporary magazines, especially if you know who was driving it at the time. This can take a long time and we recommend a visit to our Reading Room to undertake the research. We do not hold any vehicle registration records, although we may be able to tell you where you can find them if they still survive. Can you tell me what my car/motor cycle/motoring related object/motoring books are worth? In common with all other museums the National Motor Museum does not give valuations. Please consult one of the auction houses specialising in automobiles and/or automobilia. One of my ancestors drove at Brooklands. Can you tell me about him/her? Many families have stories about relatives who are said to have driven at Brooklands. In most cases this story has passed down through the family and people assume that it means they must have raced at the circuit. In fact, from the time the track opened in 1907 until its closure in 1939, it was possible for members of the public to turn up on non-race days and take their car around the circuit for a charge of 10 shillings or 5 shillings for a motor cycle. Unless your ancestor is known to have been involved in motor sport at the time it is far more likely that they too paid for a lap. Brooklands Museum is currently compiling a list of every driver/rider known to have raced at the circuit between 1907 and 1939. When is a car called veteran and when is it vintage? Cars built before 31 December 1904 are categorised as Veteran. An identical car built in January 1905 would not therefore be referred to as Veteran but, in common with other cars built between 1 January 1905 and 31 December 1918, would usually be referred to as Edwardian. Cars built between 1 January 1919 and 31 December 1930 are classified as Vintage. Certain makes of quality and sporting cars built in the years between 1930 and World War II are referred to as Post Vintage Thoroughbred. The term Classic Car is not necessarily defined by any specific time period and is open to interpretation. All motoring enthusiasts have their own personal favourites that they consider to be Classic. Motor cycles are classified slightly differently. The Vintage Motorcycle Club uses the term Pioneer for machines dating from before 1905 and Veteran for those from the period 1905 – 1915. As with cars, the term Vintage refers to motor cycles built in the years before 1931. I’ve been told that my car was once on display at Beaulieu. Can you tell me anything about it? We frequently receive enquiries from people who have been told that their car was seen ‘at Beaulieu’ at some time in the past. Many people take this to mean that the car (or motor cycle) was part of the Museum’s Collection at some point. Many cars and motor cycles have passed through the Museum in the last sixty years and we do have records for most of these. However, we find that the majority of these stories relate to vehicles that have visited Beaulieu for one of the many hundreds of club events and rallies that have been held here over the years rather than as exhibits in the National Motor Museum. How can I donate a vehicle or motoring related item to the Collection? We actively collect material relating to the history of motoring in Britain. We also collect items relating to the history of The National Motor Museum and the Montagu Motor Museum. Can you answer my caravan related questions? In addition, the Collections Centre is home to The Caravan and Motorhome Club Collection which reflects the long history of the Club, formed in 1907. Can you answer my enquiry relating to the history of the Montagu Family and/or the Beaulieu Estate? We cannot answer your enquiry ourselves. However, if you get in touch we can direct you to the Estate Archivist. Can you answer my enquiry relating to the history of the Montagu Motor Museum or The National Motor Museum? We hold material related to both the original Montagu Motor Museum and The National Motor Museum. Please contact us and we will be happy to help with your enquiry. I have a motoring related object how can I find out more about it? We are happy to help you to identify your object and learn more about its history. Please contact us to find out how we can help. Can I lend items to the Collection?